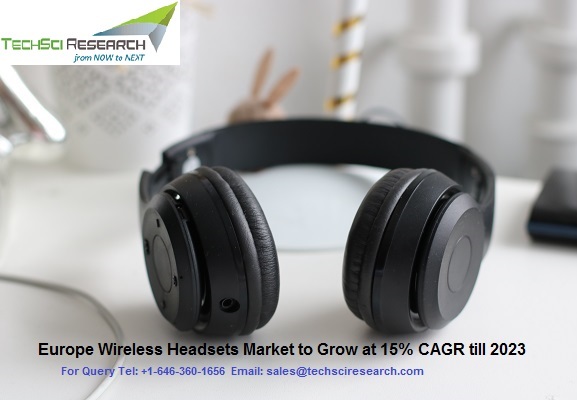 According to TechSci Research report, “Europe Wireless Headsets Market By Type, By Distribution Channel, By Country, Competition, Forecast & Opportunities, 2013 – 2023”, Europe wireless headsets market is projected to register a CAGR of over 15% during 2018 – 2023. Number of headsets shipped, globally, grew from 331 million units in 2015 to more than 340 million units in 2016. As wireless headsets are becoming increasingly sophisticated in providing audio output as well as hassle-free connectivity with other electronic devices such as laptops, smartphones, music players and tablets, their demand is significantly growing across the region. According to the World Bank, internet penetration in Germany grew from 87.59% in 2015 to 89.64% in 2016. Germany emerged as the largest contributor in Europe wireless headsets market in 2017. As multi-branded stores offer the convenience of access to multiple brands available at a single point of location, this distribution channel in the region’s wireless headsets market dominated the market in 2017 and is expected to continue its dominance during the forecast period as well. Though on-ear segment accounts for majority share in wireless headsets market in Europe, earbuds segment is anticipated to register the fastest growth, as they are more comfortable and easier to use. “Rising number of mobile users in countries like Germany, France and UK are expected to significantly drive the market for wireless headsets in Europe, as the category seems to be beneficial from the customer point of view for enjoying personal space. The category earlier was dominated by corporate and professional space. Now, the demand has started coming from individual customers as well as they seek to enjoy wireless services on their personal devices.”, said Mr. Karan Chechi, Research Director with TechSci Research, a research based global management consulting firm. “Europe Wireless Headsets Market By Type, By Distribution Channel, By Country, Competition, Forecast & Opportunities, 2013 – 2023” has evaluated the future growth potential of wireless headsets market and provides statistics and information on market structure, size, share and future growth. The report is intended to provide cutting-edge market intelligence and help decision makers to take sound investment decisions. Besides, the report also identifies and analyzes the emerging trends along with essential drivers, challenges and opportunities present in Europe wireless headsets market.